n May the 14th 2015, together with other press representatives, we participated in the first official presentation of D/A Converter that its manufacturer, Chord, described as: „the most advanced DAC in the world: DAVE”. It was obvious that even for the representatives of Kent based manufacturer it was a very particular event. 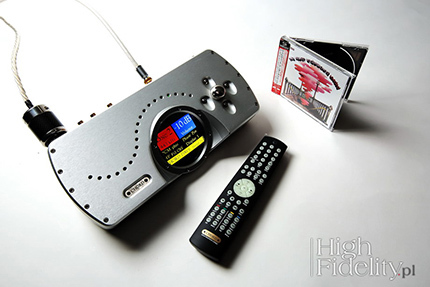 Two previously released DAC/headphone amplifiers, Hugo TT and Mojo were and still are very important for Chord, as they've been generating huge sales. But when it comes to products that build company's image and prestige, that use new technologies and solutions that later shall be used for less expensive products, the Chord's top D/A Converter is a key products for the next few years. According to Chord's CEO, John Franks, DAVE is an acronym for ‘Digital to Analogue Veritas in Extremis’, although when coming up with the name they initially wanted to use Latin version of ‘Extreme Truth’ or ‘Veritas’, to walk away from naming products using letters and digits. Just like in the case of Hugo TT also this time the product is based on top class engineering. Rob Watts, who designed a breakthrough DAC 64 for Chord, and all its successors is also a 'father' of this project. Mr. Franks adds, that the project, now known as DAVE, started already 8 years ago when they were working on Hugo TT, that – an interesting fact – utilized many solutions developed with DAVE in mind. Rob Watts spent many month working on this project, and a large chunk of that time he spent listening to the product, changing/improving elements that still required an intervention. What's more, Rob tested not only whole new prototypes of DAVE, but also its elements. He did his best to perfect operation of each of them. He spent a lot of time writing software for his proprietary FIR digital filters he named WTA (Watts Transient Aligned) featuring 164 000 taps. The latest version works with frequency of 256fs, meaning that input frequency is multiplied by 264 – that's a unique value. For this process alone Chord uses a chip capable of processing as much information as 166 separate DSP cores. Then digital signal had to be converted into analogue one. For that purpose Watts also developed his own solution: a 20-element „Pulse Array” DAC, with discrete resistors that are switched using transistors, and a unique, analogue 2-nd order „noise shaper” filter that 'moves' noise beyond audible sound range. Wide array of digital inputs allows user to deliver almost any signal to DAVE: PCM from 44,1 kHz to 768 kHz (2 x DXD) and DSD (up to Quad DSD). DSD signal might be delivered in its native form (more about this technique HERE), or using DoP protocol – depending on selected input. Separate filters were developed for PCM and another one for DSD. One chooses proper filter in the menu and can see the choice on the large, color, LCD display. It present information on selected input, sampling frequency, and volume level. DAVE is not only a D/A Converter but also a digital preamplifier. Using a knob or remote control one can adjust volume level which allows DAVE to directly drive a power amplifier. If this function is not needed it can be turned off. I forgot – there is also a headphone output. Chord developed three „Crossfeed” filters for it, which make presentation more spacial. DAC might be place in a special rack – it looks really good in it plus anti-vibration properties of this rack improve performance. One thing though – rack comes at pretty steep price of 9390 PLN. Already Hugo TT, less expensive than DAVE and representing previous technological generation DAC proved that Chord created a very special product. When fed with signal from a CD transport it delivered performance of comparable quality to my trusted Lektor AIR V-edition CD Player. There were some obvious differences between them but they were surprisingly small. A character of those differences was to my liking, following my own sonic preferences. Time spent with Red Reference MkIII HDSD, a CD Player based on Chord's QBD76 DAC confirmed my previous assessment, adding on top one more observation – newer generations of Chord D/A Converters were getting even better. While being less analytical they become even more resolving, and at the same time they remind more and more of analogue sources. Before delving into sonic qualities of this device let us pause for a moment and consider another issue first: with or without preamplier? It's an important question as answering it will allow each potential user to decide about a role DAVE is to play in particular system. 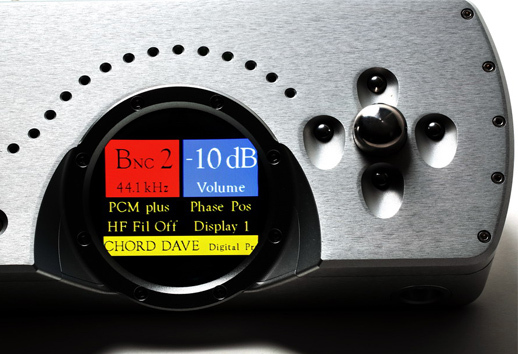 Chord's „DACs” feature digital volume control. They sport low impedance and high voltage analogue outputs, which could suggest using them connected directly to power amplifiers, so without a preamplifier in between them. 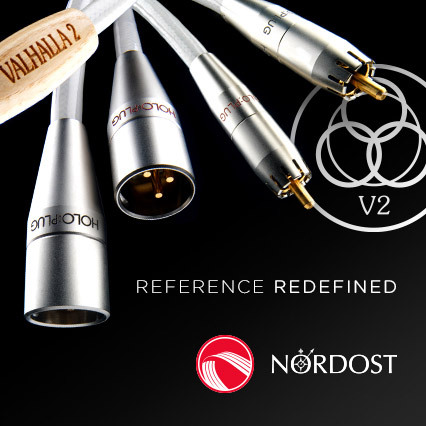 Since CD standard defines a maximum output voltage of 2V RMS (0 dB), one could say that a device with variable output offering even higher output signal means that the device features an integrated preamplifier. If the said device delivers signal no higher than 2V then it should be called a source with variable output. DAVE, in company's paper is named a D/A Converter, but sometimes its mentioned also as Digital Pre-Amp. This second term one finds on the PCB, printed right below logo and information about person who designed the device. So what is it actually? Well, if you use definitions I gave you above you won't have a problem answering this question. You should realize that Chord DAVE is a two-in-one device – a Digital to Analogue Converted and preamplifier in a single box. Headphone output in this particular case is just an addition to the main functions of the device (I will elaborate on that later). 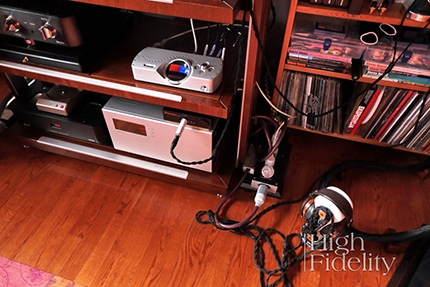 During this review Chords worked in several configurations but with two of them being paramount – it either worked as DAC with an external preamplifer or drove directly my power amp. The preamplifier in question was Ayon Audio Spheris III, and power amplifier was Soulution 710. When used in pair with preamplifier I used the -6 dB setting for Chord's output, which equaled the value of ‘89’ of my Ancient Audio Player, so it must have meant output signal of around 2 V.
Multiple comparisons using both, balanced and unbalanced (actually preferred by me) connection proved that DAVE's performance benefited from high quality external preamplifier. Without it the attach phase seemed more powerful, sound was presented closer to the listener, and there was significantly more treble. The latter were amazingly clear and if I was to use this DAC in a studio I would love them this way, as all the details were presented in a particularly transparent, pure way. This would also work very well with DAVE partnered with some tube amplifier offering a bit dark, slow sound as Chord would 'inject' it with lots of energy transforming its sonic signature into lively, vigorous one. This type of presentation will also fit not so vivid loudspeakers. But if your system does not need such a 'performance enhancement' you should pair DAVE with high quality preamplifier which will result in a richer, denser sound. Sound won't be presented that close to the listener and yet vocals will be bigger, more three-dimensional. Also spatial relations between musicians will be delivered in a more transparent, more accurate way as these won't be masked by overwhelming amount of details. As for bass – it might seem that control of this part of the range is better without preamplifier, but it is actually not true – this impression is created by, above mentioned, more powerful attack phase. With preamp DAVE offers deeper, richer, more dynamic bass. So if you ask me – in a high performance, well balanced system DAVE should be paired with an external linestage. I liked Hugo TT, that I mentioned at the beginning, very much. I used It for an extended period of time without feeling a need to return to my trusted Lektor, although I knew all the time what would happen, what would I get back when finally Chord would go to the distributor, It is different with DAVE. Considering all factors in I have to day that it offers even better sound quality than my Lektor, similar, although not quite the same, as dCS Rossini Player and totalDAC d-twelve Converter. I believe that it's no accident that all three of them feature discrete circuits for D/A Convertion. On one hand Chord is as resolving and as smooth as the British Player with external oscillator, on the other it shares many sound features of another great CD Player, Vitus Audio SCD-025 MkII. The higher resolution is a result of more information being delivered than by Lektor, and not from emphasized attack phase of the sound. I'd even say that DAC's treble is slightly rolled off compared to Player's, so that is not a reason of described difference. Vitus on the other hand delivers darker, more creamy sound, so it's also not about more three-dimensional sound and the depth of the soundstage. Chord offers a true depth and resolution. Listener does not pay attention to details and yet he perceives music in a deeper way. He receives information not only about dynamics and timbre but also about tiny changes of sound level, about changes and fluctuations of energy. It makes music sound richer, more involving, able to keep listener's interest for a longer time. DAVE delivers also a fantastic bass. It goes really deep, it is particularly tuneful, rich but also its definition reaches remarkable level that allows listener to better understand a recording. I know only a handful of other sources offering similar level of performance such as dCS Rossini and Vivaldi. Also CEC TL 3.0 CD Transport offers similar sound signature. I recognized that when listening to Hollywood from Smolik and Kev Fox album, where electric bass creates the rhythm for the whole track without actually driving it. It slowly builds and maintains a certain level of suspense using precise, short phrases. With Lektor, and consequently with most digital source I reviewed (with only few of them offering higher level of performance than AIR V-edition) this type of change is communicated via changes of sound level, of 'how much' sound there is. DAVE confirmed that it is an important element of performance but there were also other, equally important such as phrasing and sound density. The last time I experienced such a fantastic presentation of changes in dynamics was with two amplifiers: Naim Statement and FM Acoustics, and before that I'd heard it with Ancient Audio Silver Mono Grand. Comparing sources costing less than 50 000 PLN and you won't even notice that. But use this Chord for comparison and it will become clear to you.